I’ve documented a little bit of my descent back into full blown Warhammer 40K addiction. Sunday I took the next big step forward. 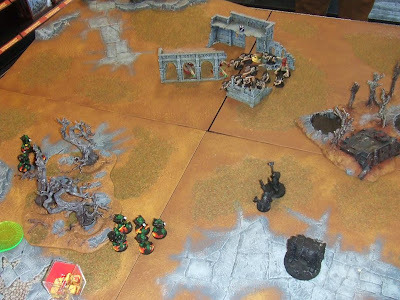 I boxed up all my little army men and went down to my local Games Workshop store and played my first game. Now I had played 15+ years ago, but the rules have changed three times since then so I’m going to just say I’m a beginner and leave out all that old history. Today’s recap is going to be pretty easy to follow; I’ll keep game terms to a minimum for the non-Warhammer players out there. In the future we may run more detailed battle reports. 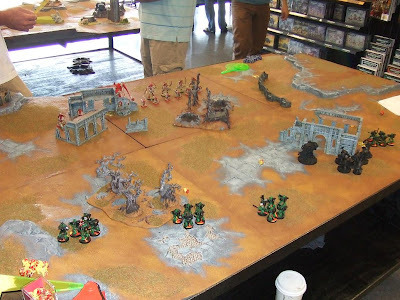 The game basics were I was fielding 800 points of Salamanders. Not a lot of points, but except for one piece, it is everything I have assembled right now. My opponent was a local Tyranid player who took second place in the store’s tournament last week. I honestly was not expecting a win. Before we go into the report I have to mention my opponent was awesome at helping me through my first game. We used a standard setup and we had three objectives to hold to win the game. I managed to steal the initiative. Both of our first turns were spent moving up our units. The second turn made things more interesting. My Dreadnought and my heavy bolter marine both scored a wound on his Tervigon (it has six to begin with). 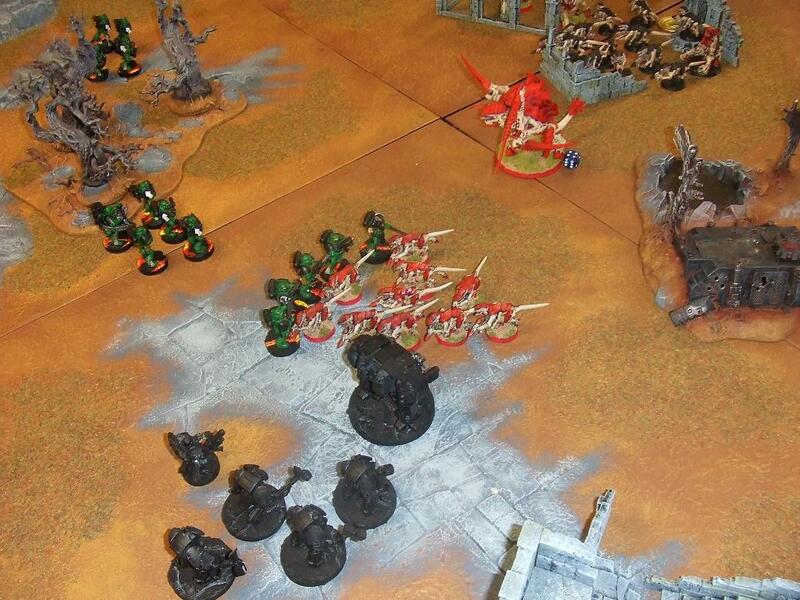 A Mycetic Spore drops behind one of my combat squads and two Zoanthropes attack the back of my Dreadnought. Their attacks blow up his multi-melta arm and immobilize him for the rest of the game. Shooting from his swarm of Gaunts manages to take down one of my Terminators. On my far right side his Warriors take out two of my marines. I wasn’t feeling all that great at the start of turn three. Well I was having fun; I just didn’t think I was doing very well. 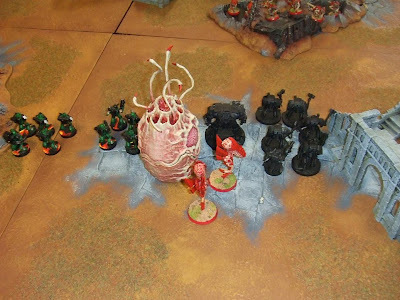 The Mycetic Spore is destroyed after being hit with a flamer and heavy bolter. My Captain leads the Terminators in destroying the Zoanthropes with their thunder hammers. A combat squad and a swarm of Gaunts meet in hand to hand combat. 2 marines fall and 3 Gaunts are destroyed. The game starts moving quickly now. The Tervigon takes another wound. 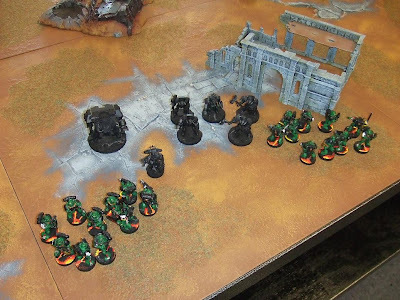 My Terminators charge the Warriors, killing them, but lose two of their own in the process. My combat squad kills four more Gaunts. An area attack wipes out the remaining marines in that squad. In turn 5 the Tervigon is closing in on my heavy bolter squad. It looks like those 5 marines are going to die. Somehow the dice come up for me. My rapid fire bolters manage to wound. He manages not to make an armor save. The beast falls to the ground dead in front of them. I was having a blast. Sadly I remembered way too late that I wasn’t supposed to just be shooting the bugs, there were objectives. The Tyranids had a mass of Gaunts holding one of those objectives; I didn’t have anyone remotely near one. We rolled and the game continued one more turn. I focused all of my fire on the Gaunts and killed enough to send them running. Neither of us had control af an objective, my first battle ended in a tie. Honestly I was thrilled to tie. I learned a lot during the game and will be better prepared for the next one. Hopefully I’ll have more painted then too. The background material in a lot of the books is good enough to read on its own. I enjoy the painting and customizing aspect of the game a lot. That being said, I still really enjoy setting up on the table and rolling some dice. Luckily for me I have a place to play literally 8 minutes from my house. The Muppets and Ken O.
Phil Coulson, Agent of S.H.I.E.L.D.